At around 7 am on a lazy Friday summer morning, I look out of the window - hoping for a slightly less sunny day than usual. I was nervous, I hoped that day would go as expected. We took a cab by around 9 am after a quick breakfast - we'd rather be early than be late. Atlantis is a luxury resort located at the northern tip of the Palm Jumeirah (I always wondered how these artificial islands look like - would there be a lot of swaying palms ? Apparently not.). We drove past the Atlantis hotel, and it was definitely majestic. On one side was the hotel on a sprawling piece of land, on the other side was the Arabian Gulf - the water looked a beautiful blue. As we walked into the Atlantis, along with 100s of other tourists, I was surprised. I did expect company, not throngs of people - the activity we had chosen was quite expensive (or so I thought). However, eventually I realized that most of the crowd would take a small turn towards the aqua park and the aquarium called 'Lost Chambers'. I was restored to my original state of mind. I really wanted to enjoy the morning. We were given a map of the property, and I remember rolling my eyes (unconsciously of course) when I realized the Dolphin Bay was at another end of the property. 'Don't worry ma'am, there's a buggy that'll take you around' a nice lady quickly told me. As we walked towards the buggy, we were instantly transported to a tropical island kind-of place - there was lush greenery wherever our eyes could see. After the buggy dropped us at the entrance to the Dolphin Bay, we were greeted by the staff. But hey, I wasn't listening. I had spotted the shiny dark grey figures swimming around casually in the bay. I stood fixed to the ground, seeing them swim around in one of the large pools was so beautiful. For someone who has never seen dolphins, this is a beautiful spectacle - for kids and adults alike. After changing into a vest, we were all asked to attend a mandatory briefing session, where I learnt so much about these mammals. The dolphins here live longer than in the wild. 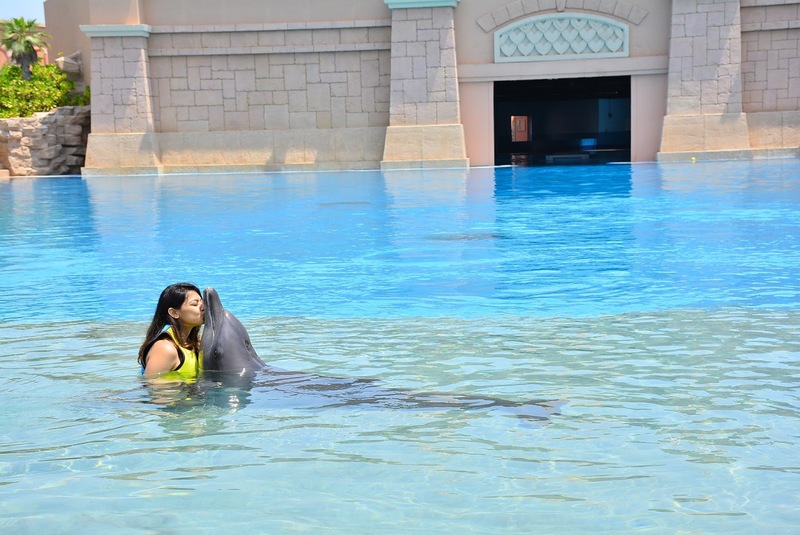 I am not talking about all animals in captivity, this is specifically at Atlantis - The Palm. The dolphins here are so well taken care of, I have a hunch, better than the human employees. Their sessions are far apart, not every 60 minutes like in some shoddy dolphinariums. They're given the best medical support too. There's not 1 or 2 but more than 20 dolphins in there, they don't feel lonely which is so important as they're social animals. My actual experience had not even begun but we were all already excited. We were then asked to enter the water (Finally!!). Even though it was peak summer, the water sent a slight chill to most visitors.We then met the 28 yo dolphin named Lisa. She was intelligent, had beautiful big eyes, and skin that I was envious of. We were asked to be very cautious, their mammal specialists treated them like how mammas treat their new born babies. We got to hug Lisa, give her a kiss and of course do a little jiggle with her. At times, I wished I was the mammal specialist - imagine spending all your time with these mammals (and getting paid for it). We were a group of 8 and while each member of the group got ready to kiss, hug and dance with the dolphin, Lisa would grace the remaining members of the group with a minute of her company. If she were a human, she would be a celebrity ! 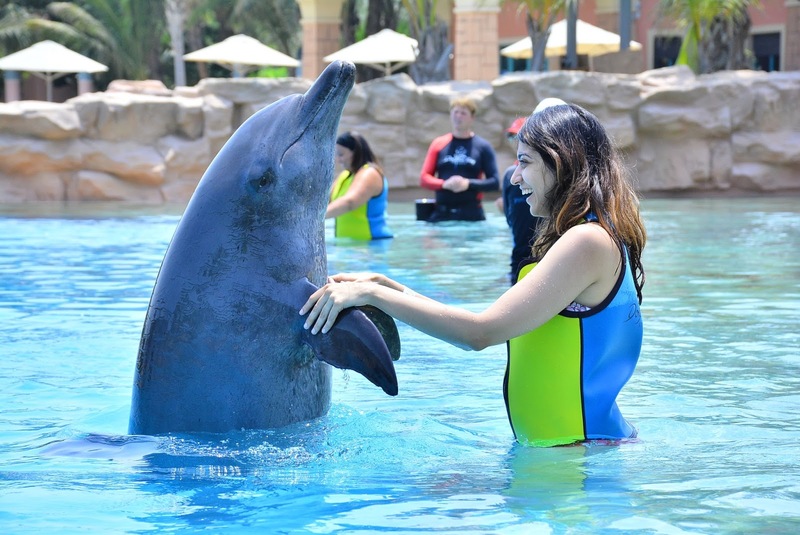 When you travel to Dubai - especially as a family with a kid or as a couple, one of the attractions that you would have on your bucket list would be an interaction with dolphins. I say bucket list as for many people, this is an over priced activity; ranging from anywhere between 150 AED to 1000 AED, or 40 USD to 270 USD. That is not including photos. You are not allowed to take in any camera / go pro etc into the water. The Atlantis really takes care of it's dolphins - and that comes at a price. For photos, there's an option (updated - October '17) where you can purchase all the photos for 500 AED. The photos are good quality - however, it's a soft copy - which I think is alright. However, if you go to buy 1 photo - you'll pay around 75 AED, so if you're a slightly big group - the 500 AED option makes sense. While buying tickets - check the price online. However, I recommend also calling their contact center, as their staff are really helpful. We were able to get an idea about all the latest offers and promotions and ultimately benefited by getting slightly cheaper tickets. If you're traveling in the peak summer months or off season, there would definitely be some offers. We had chosen the '30 minute shallow water interaction'. If you're a very good swimmer with decent stamina, you can opt for the deep water experience, for a small incremental fee. As I was going with my family and all of us had varying confidence levels in water, we chose the shallow water experience so we could be together. If there's someone in your group whom you trust would take good photos, and this person is not entering the water, then you can ask this person to take photos as long as they don't enter the water. We did see some families where one parent opted to stay outside and take photos. There's a by-stander fee of 300 AED - still is more economical. If you do care about how your photos turn out, then you would need to remember to put water proof make up or minimal make up, no bands or clips on your hair, no rings, no earrings etc - so come prepared. This is an expensive activity with an average ticket price of around 700 AED per person - however, it is a commercial activity. 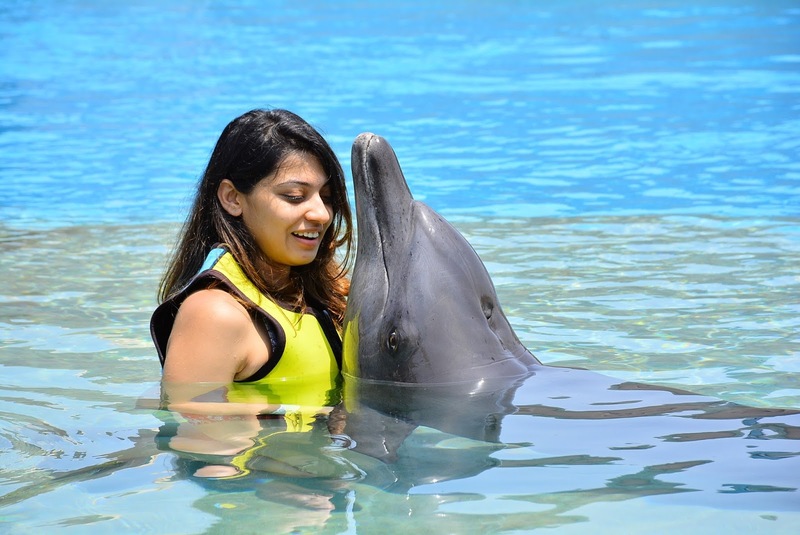 The dolphins are well trained and will treat you exactly like how they will treat others. Then it doesn't matter if you like dolphins a 100 times more than the kid next to you who couldn't care less, or if you have actually gone diving with dolphins in the past. 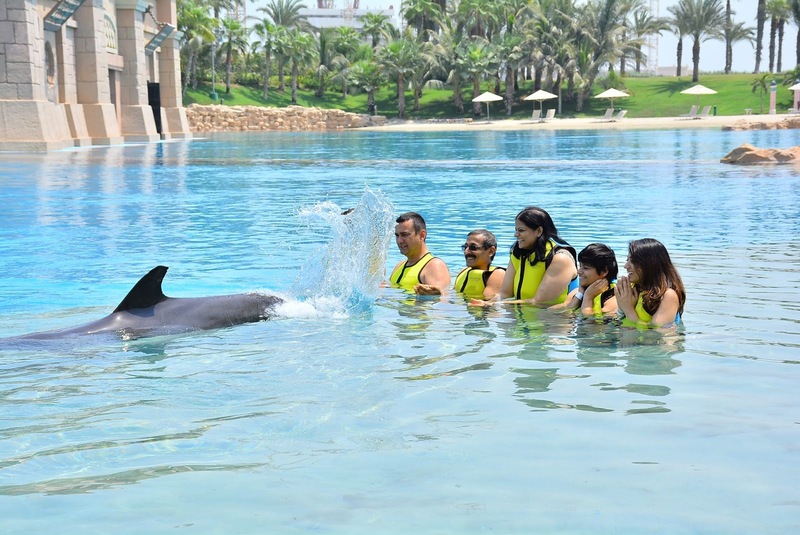 Many a times, when you buy a dolphin bay ticket, you get a complimentary pass to their aqua park. I wore a pair of swim shorts and a swim suit. Most tourists to Dolphin Bay / Aqua Park wore their swim suits with a sarong or a lose dress. A lot of people also wore their bikini. I recommend bringing in a pair of swim shorts + swim suit or just your swim suit. And a dress / something to wear into and out of the Atlantis. Bring in lots of sunscreen and a small towel. Don't bring in a big bag - the lockers are typically small. Hope you had a good read, let me know your thoughts. Also, consider subscribing to our social media handles on Instagram and Facebook.